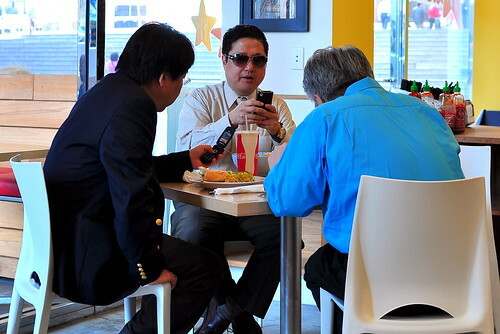 I, like countless others, intended to eat at Starry Kitchen when it was an underground supper club in North Hollywood. I, like countless others, kept procrastinating until it was too late. I, like countless others, now must lunch downtown in order to experience the culinary magic. Walking through the doors of the new Starry Kitchen late last week, the first thing I noticed was Nguyen Tran’s smiling face. The line of worker bees was stretched almost out the door, and in the midst of it all was a cool, calm, and collected Nguyen explaining the drill and moving the crowd along. It’s this kind of genuine interaction and customer care that makes Starry Kitchen really special. That, and the interesting and fresh food that Nguyen’s wife Thi whips up in the kitchen. Starry Kitchen, which is named after Thi’s favorite Hong Kong soap opera, is located in the courtyard of the California Plaza building. The place is only open for lunch at the moment, but Thi and Nguyen hope to extend service through dinner on Thursdays and Fridays in the future. Whereas the NoHo crowd was mostly comprised of media-savvy mavens, the one downtown is made up of business-minded professionals. It’s been years since I’ve been a part of the rat race, so it was a treat to people gawk watch. “Pick your protein, then pick your vessel,” stated the adorable chalkboard menu. Most lunch combos also include a side of something carb-related. The menu rotates each week, so I was stoked to drop in when both the beloved crispy tofu balls and the Vietnamese braised coconut pork were on offer. 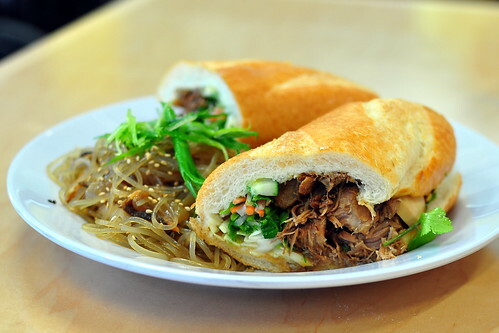 The Astronomer ordered the Vietnamese braised coconut pork in a banh mi sandwich with a side of Korean japchae noodles ($7.50). The pork was shredded, moist, and heavy on ginger, while the bread was soft yet sturdy. The bevy of veggies inside were snappy and lightly pickled. The Astronomer thought that the sandwich was very tasty, but wouldn’t call it a proper banh mi due to the mild veggies. 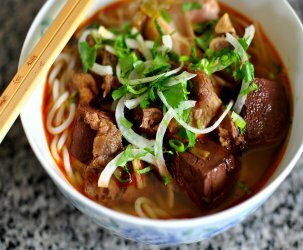 We both agreed that the pork could’ve used a heavy dose of fish sauce and plenty more chunks of blubbery fat—two essential components of the classic Vietnamese dish thit kho. The noodles were more than competent. I ordered the crispy tofu balls in a wrap with a side of pineapple fried rice ($7.50). I wasn’t sure what to expect as I bit into the fluorescent green orb, but the flavors and textures were totally to my liking. Little kernels of corn provided a touch of sweetness and texture to the balls. The wrap and its various fresh and healthy components reminded me of the macrobiotic fare I downed at M Cafe de Chaya not too long ago. I loved the curry flavor of the pineapple fried rice. I usually brown-bagged it during my days running in the Philadelphia rat race, but then again, my choices included the yawn-inducing Au Bon Pain and a local chain called Marathon Grill. If Starry Kitchen moved in or around my building, I’d jump on it. I find it kind of amusing that I am going to be the last person (media-savvy or otherwise) to try Starry Kitchen. Where were you in the Philly rat race, cause that sounds like where I am haha! Diana, I haven’t tried it yet either! C, what are you using to edit your photos? They are so vivid! 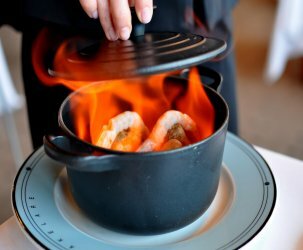 You do take some NICE shots Gastronomer! Thanks for the write-up, and the awesome pics. Diana- haha, I wouldn’t say we’re like M Cafe EXCEPT when it comes to more the vegetarian stuff… but then again, still not so much. Hope you like us anyway ^_^ And you won’t be the last person, I promise. There are plenty more I haven’t met or reached out to, some come on over. -Fish Sauce + Thit Kho: agree w/ ya, but the KN decided against it for mass consumption (but for individual/small consumption we likey). Nice post, Gastronomer! 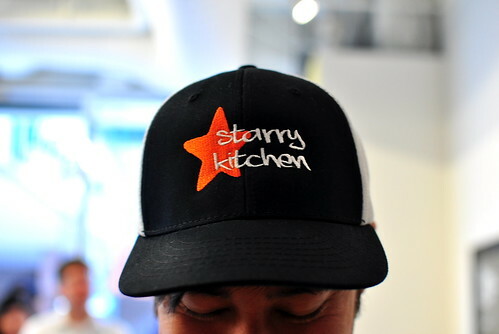 Glad you got to finally try the wonderful food at Starry Kitchen! Like Marie, I look forward to when SK is open for dinner. 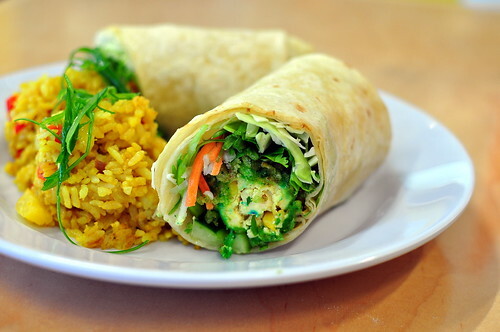 the wrap looks good. my lunch time is non existent so perhaps on my day off. Nice, can’t wait to try some of their stuff finally. Only known them through twitter but those corn-studded tofu balls sounds right to my taste buds! “Culinary magic”? Is Starry Kitchen really that good? After Midtown Lunch, and now this review, I’m intrigued. I was wondering what Starry Kitchen was all about. I know it’s no longer top secret but that makes it more accessible for me, it’s a beautiful thing! Nice post! I’m dying to try those tofu balls. But I’ll pass on the rat race. Weez – I use Picasa for photo editing. Google rules my life. 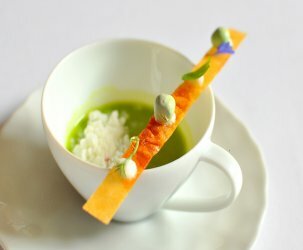 FoodGPS – Keep your expectations in check and you’ll have a great experience. 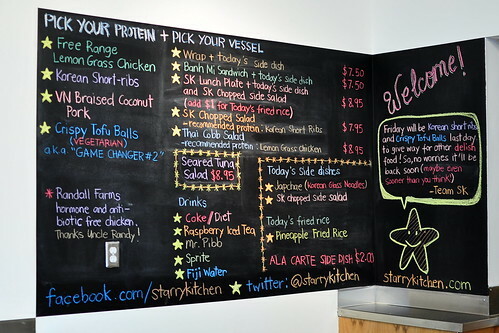 Starry Kitchen makes fresh and interesting lunch fare—nothing more, nothing less. I understand the procrastination part. I think I’m interpreting you to say this place is worth going into Downtown LA? Nice to see you finally tried SK. I did enjoy those tofu rice balls! Pingback: The Buzz: Starry Kitchen : Smashbox Yello!